Now back to this ---smurfing--- glue removal. My slim LCD is not done after 5 years. I dont know about you guys, but I would actually like to play some video games. Hah the worst thing i did was make mine playable. When start to work on it my roommate comes over and wants a game puzzle fighter that turns into like 20 games and a 12 pack. I need to yank the cpu out or something to finish. 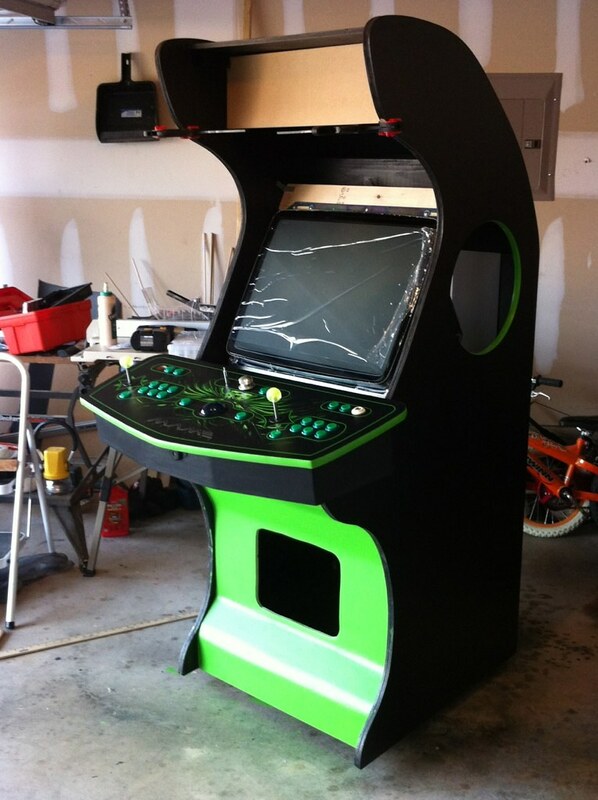 I converted a Joust cab a couple of years ago and the same thing happened to me, got about 80% there, made it playable, and never finished it. Ended up selling it to help fund this one. Definitely wont happen this time. I am working on the control panel now and have run into an unanticipated snag. I need to see if anyone knows how to approach this. Perhaps punch in the hole a little so the screw sinks in, a different screw? Is there such a thing as a metal countersink? Is there such a thing as a metal countersink? Yup, it's called a drill bit. Just don't drill the hole all the way through. Awesome, thanks. I am a mental midget when it comes to fabrication. 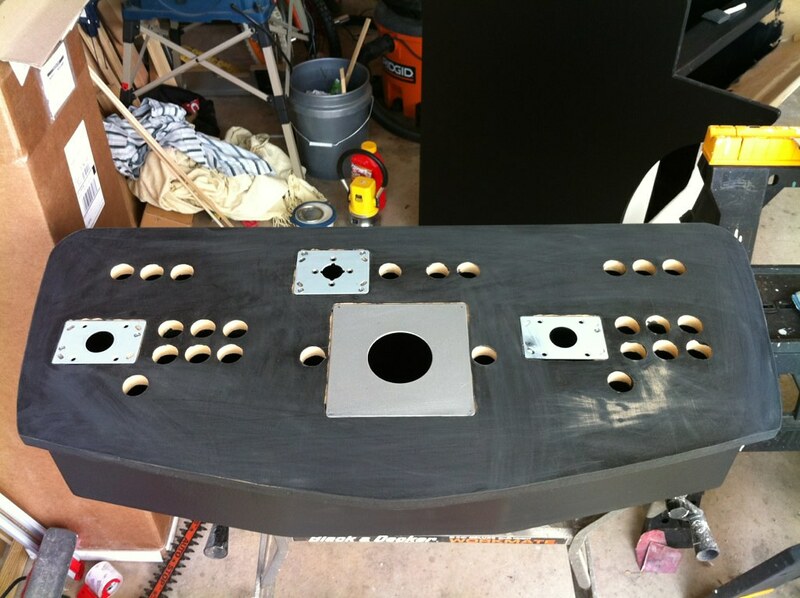 My control panel should be done within the next few days. 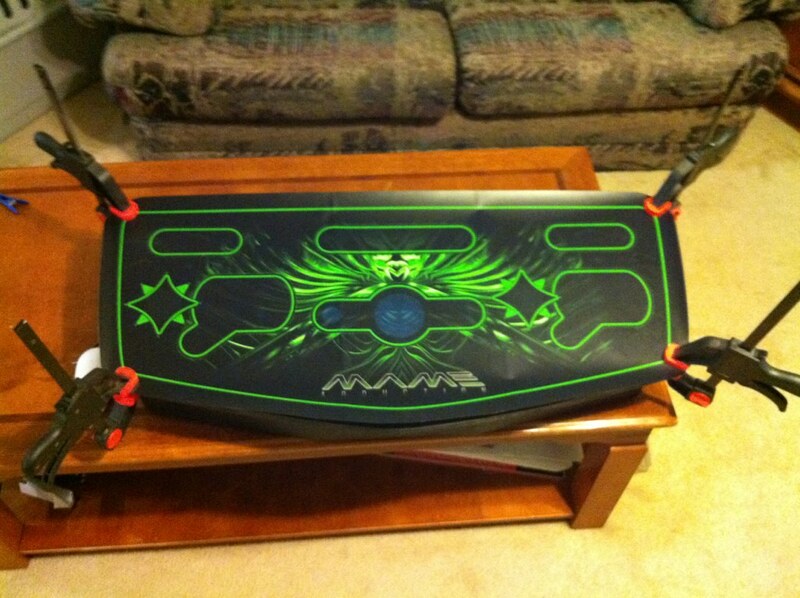 Got everything routed, just need to mount the joystick plates. 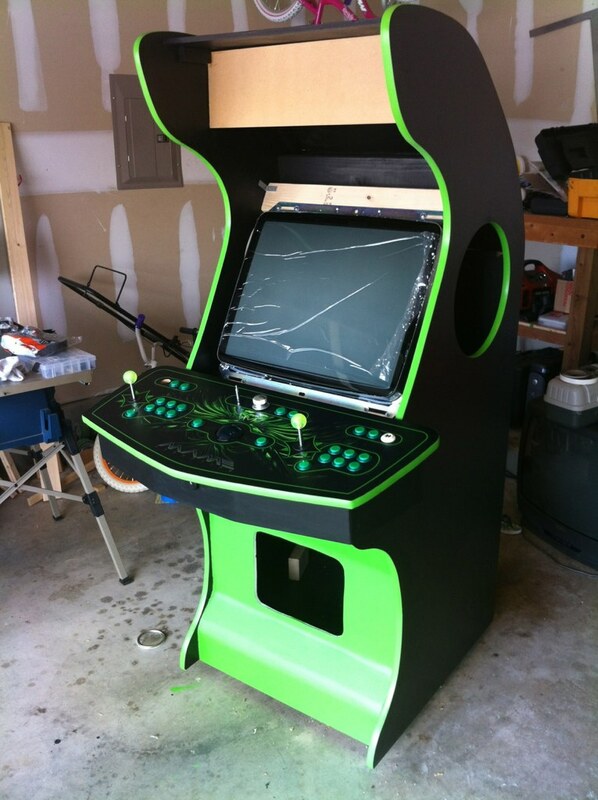 The control panel artwork should be in within the next couple of days and I should be set to start wiring. I like this project. I found the perfect barstools for you. Thanks spkywlnt, where did you see the bar stools at, they are pretty cool. Here ya go. http://www.overstock.com/Home-Garden/Bar-Stools/2023/subcat.html. Once you get there, just click on furniture on the left and then barstools. For some reason the link won't bring you straight there. I just googled barstools and thats the first place I checked. If you find them cheaper somewhere please let me know. I about have the cabinet done. I am just lacking the marquee mount, the back door, speaker mount and a couple of other smaller items. I am going to start painting the green for the front today. 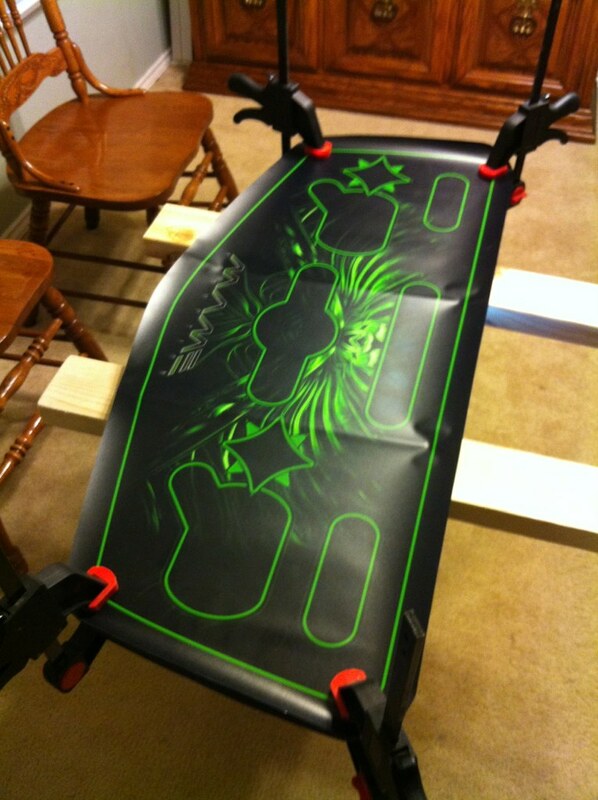 I have been debating whether to actually cover the front piece with a piece of laminate then paint that. It would really smooth things out, but man, if I screw something up, that would be a nightmare to remove. I will probably paint it first, see how things look, then make the decision on the laminate. All plates are in the control panel. 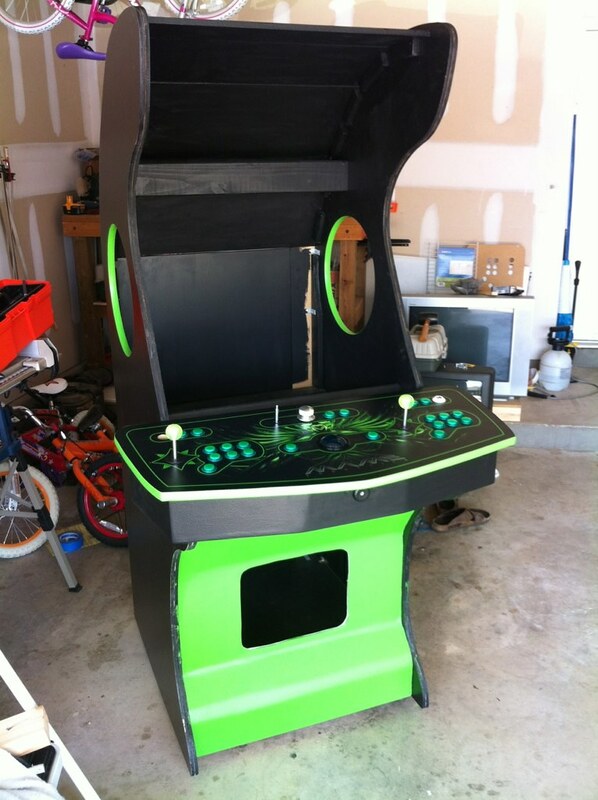 The hinge is in place in the front, I am just waiting on the artwork to come in from gameongraphix.com, then I will get that finalized and ready for wiring. 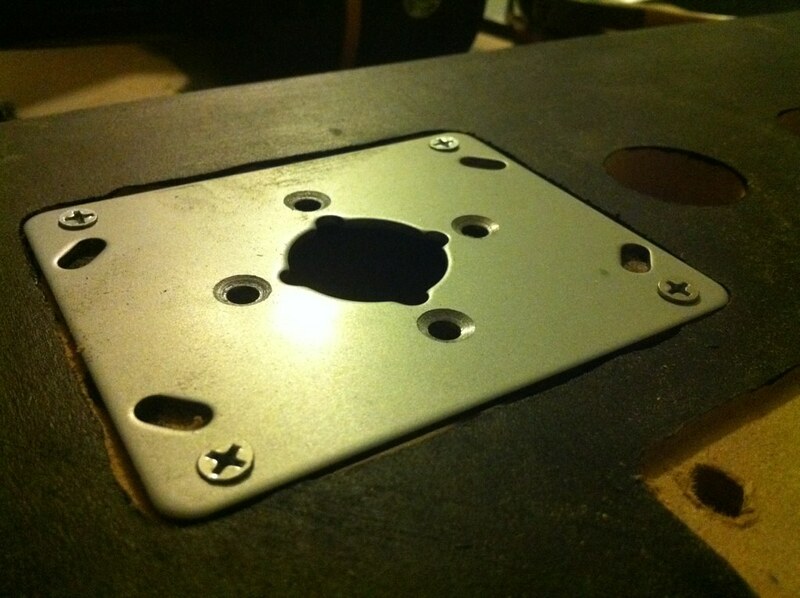 The monitor came in two days ago and I have the mounting studs in place for that. 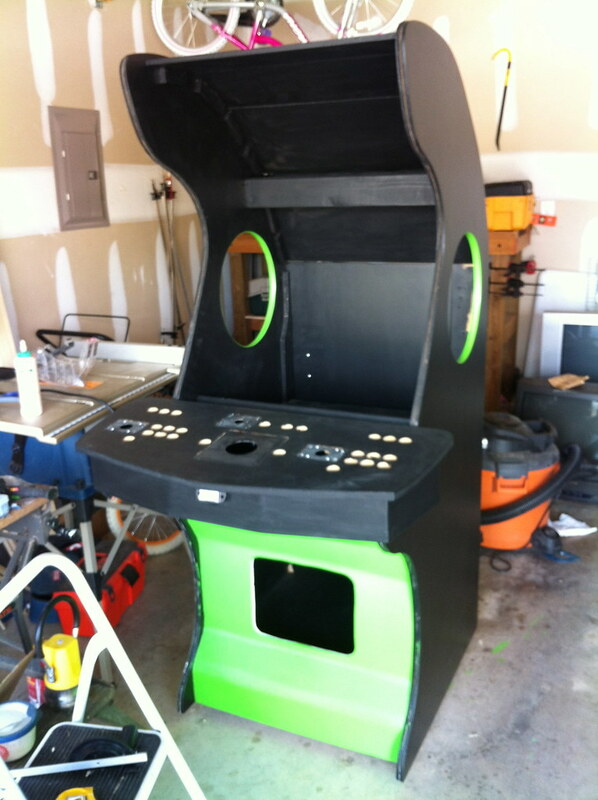 I will hold off until I am a little more complete and can bring the cabinet inside before I mount it. I really dont want that $500 chunk of electronics sitting in the garage. I have the speakers now and will put those in place here within the next few days. 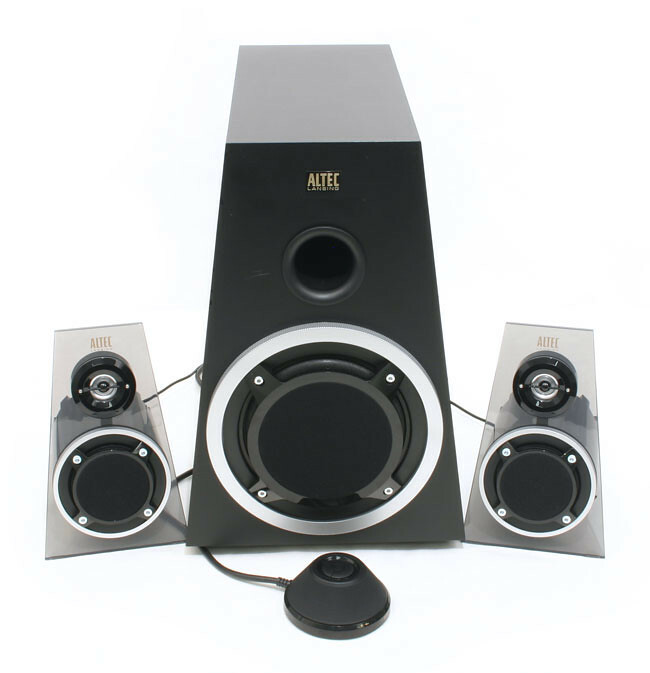 I chose these because they got good reviews and I liked the way the tweeter and mid range speakers were mounted. 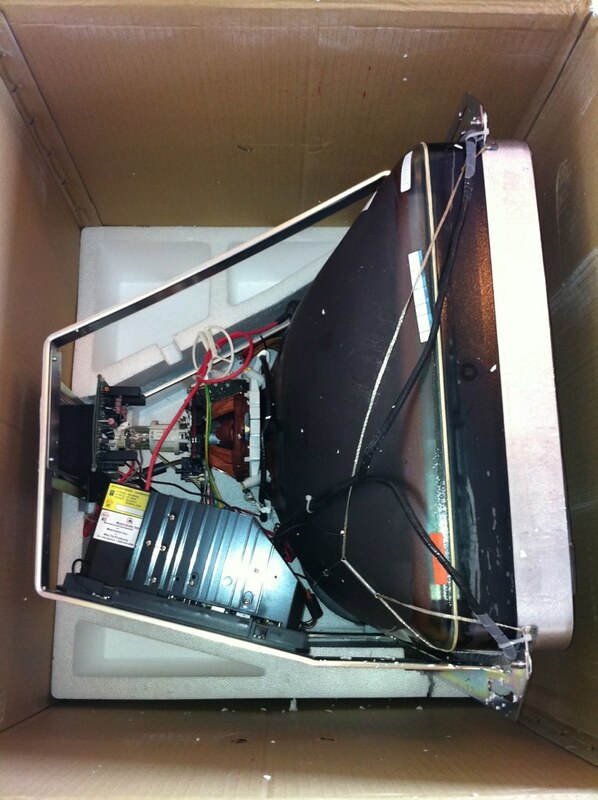 Nice and easy to remove and mount into a cab. Lastly, I am working on the guts now too. 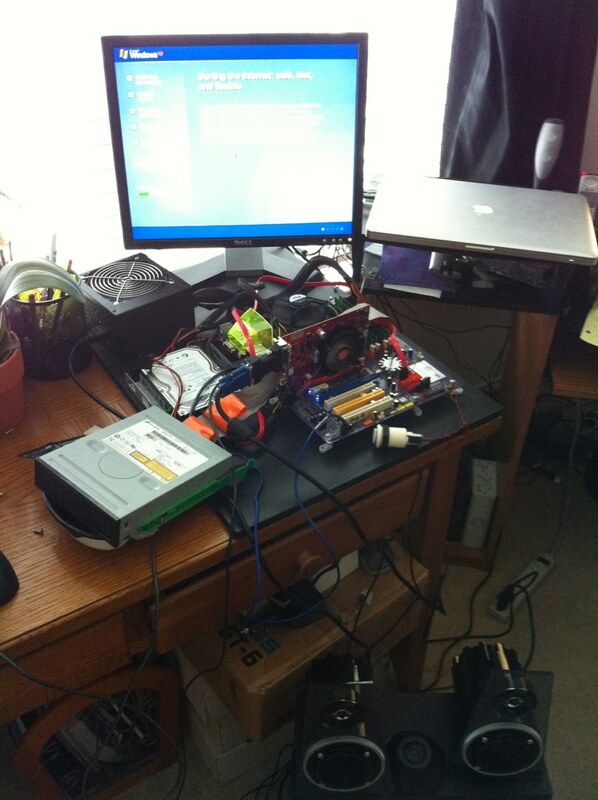 I have mounted the motherboard, but am sitting here staring at the power supply and hard drive. The hard drive should be easy enough to find an l-bracket or something, but the Power supply does not seem so straight forward. If anyone has any examples, I would like to see them. Also on the power, I have a 550W power supply coming in. That should be enough right? I also have a arcade power supply (pictured above), but I would rather stick to just the computer power supply if possible. I am only going to be powering the actual computer parts and a few cathode tubes with it. So, I think I should be good. Still on the power, I am trying to work out the best way to get power into the cab. I dont want to just plug a power strip in the box. I have come this far trying to keep things pro, so a power strip seems cheap. I will have to research some options. Once again, any examples anyone has would be great. I dont see anything wrong with a good power strip, especially the ones with controlled outlets, so everything will shut down and turn on at the same time. Cut the cord and connect it to plug i have pictured and you have a clean look from the outside. I used 2 power supplies, one for lighting and the other for the computer system. I jumped the supply not connected to the PC, and the setup has been working great. I used a hard drive rack from an old PC and bolted that down, and slid the drives into that. The power supplies, i used some wide L-brackets with the multiple holes (you can see one on the DVD drive) and just add a new hole where necessary. Post some pics once I have a little more to show. The cabinet is very close to completion. I finally got a back door installed the other day. And the computer is mounted and loaded ... Apparently Windows XP has an exciting new look. I had a bear of a time getting the ArcadeVGA card to work well with the setup, but after a bit of finagling, it is working well now. The only problem I have is most games will not run. I do not know if it is an issue with this card and the monitor it is attached to not supporting any weird resolutions, but I will troulbeshoot that a little more once I have the monitor in the cab and have everything pulled in the house. Yesterday I sat next to the window like a 5 year old waiting for the ice cream truck, but the truck I was waiting for was brown, and it did have something pretty damned sweet on it, the marquee and control panel artwork! So I ordered these through gameongraphix.com. The quality is very very nice. While the quality of the prints were good, I do have several gripes. 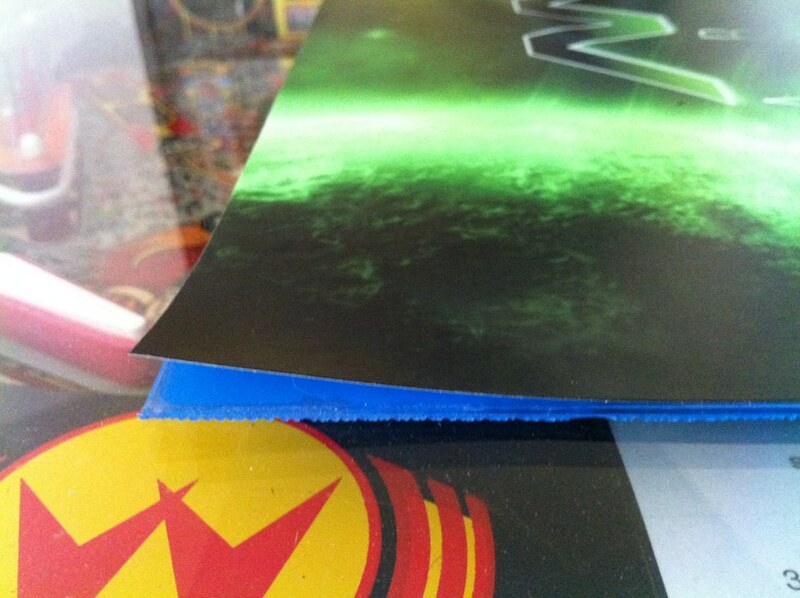 The glue used to mount the marquee artwork to the plexy is crap. when I got it, it was full of bubbles and the corners were pealing up. It was also not mounted on evenly. I am going to peal it up and remount it with some better glue. The size is also off. The control panel artwork was a whole other nightmare. Despite being rolled up in a nice hard round tube, It was severely bent in several spots leading me to believe it was bent before it was placed in the tube. If you look in the picture above you can see the two huge creases on either side of the trackball area. This made it ridiculously hard to get on the control panel correctly. 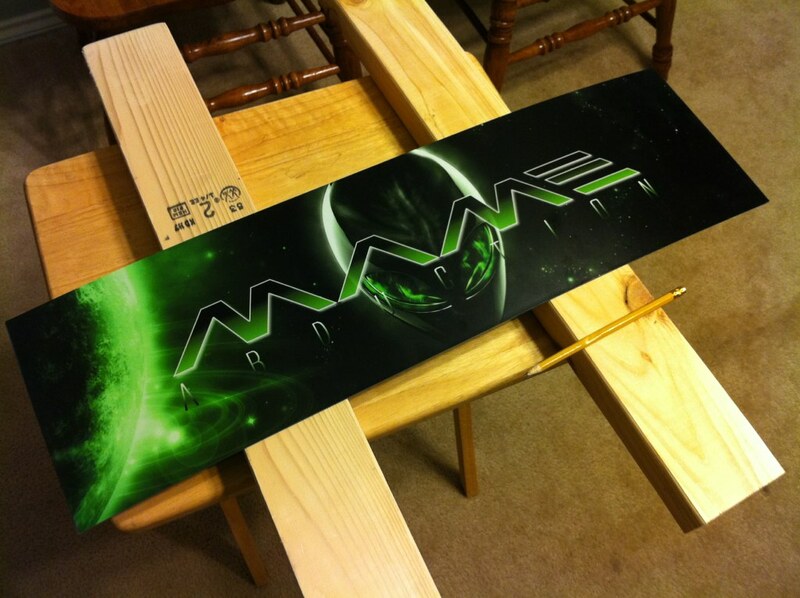 I am also going to have to say that while the material is pretty awesome, Unless you are mounting it on anything other than a totally flat piece of wood or plexi, dont use it. I place it and you can see every depression and other inconsistency in the surface. On mine there is a really obvious depression on the joystick and trackball plates. 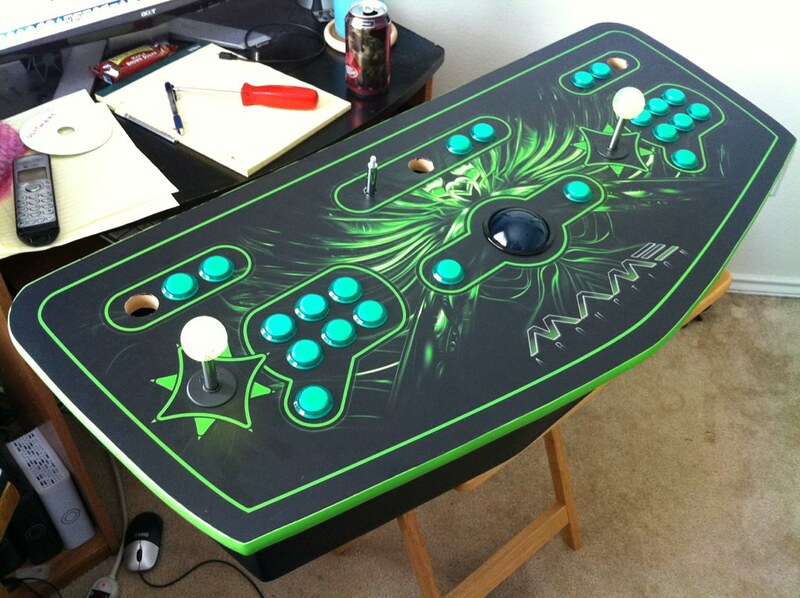 While not a game stopper, I am seriously debating remaking the whole control panel now. Since I have already routed the tmolding slots, that is what I would have to do if I wanted to go plexi. I am going to finish the project first then see how much it bugs me. It is only obvious if the light is right, which it may be under the glow of a monitor. Anyway, enough bitching and back to the good stuff. Lining up everything was a little tricky. 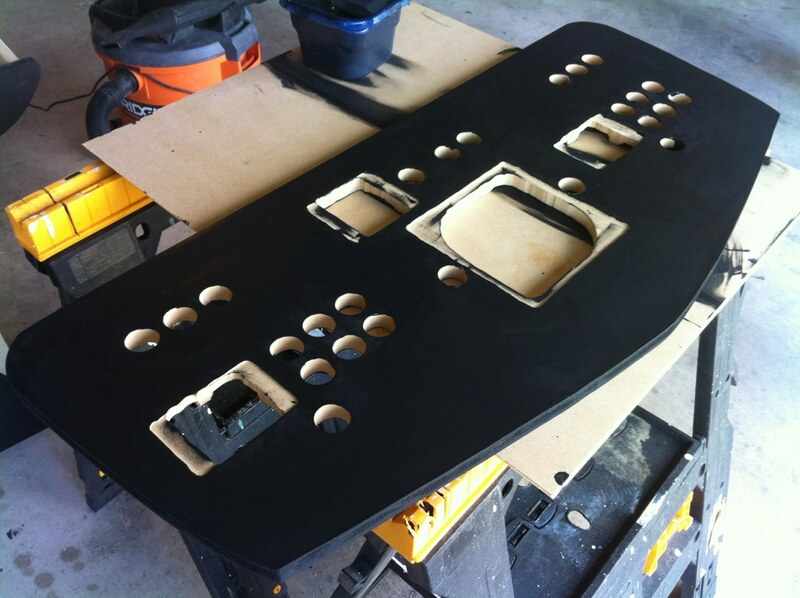 I had the control panel printed with a little extra black around it so that I could trim it to size. I ended up putting a light underneath the control panel so that the holes would shine through the material and give me an idea of where the holes were before I stuck everything. Worked like a charm. 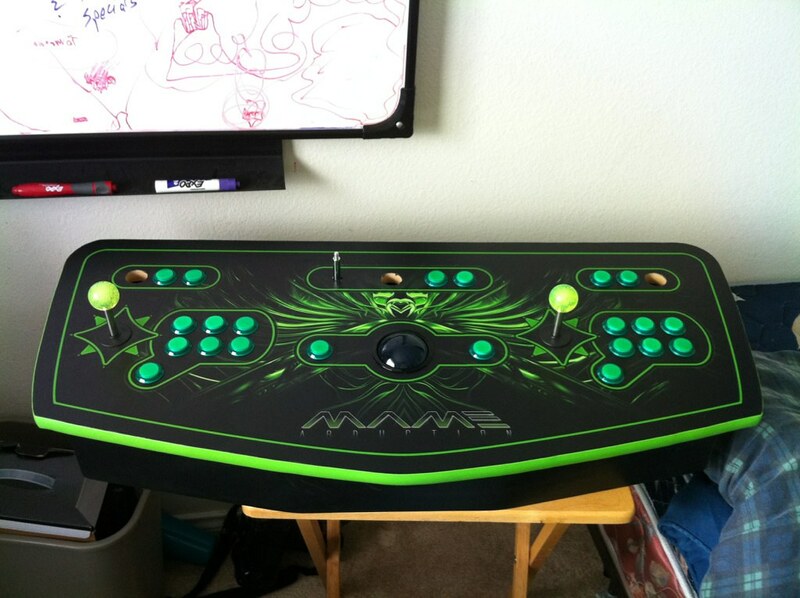 So after the control panel artwork was mounted, I got to mounting the buttons. Here's the final product, not perfect, but pretty damned sharp. Its going to be a busy week now. 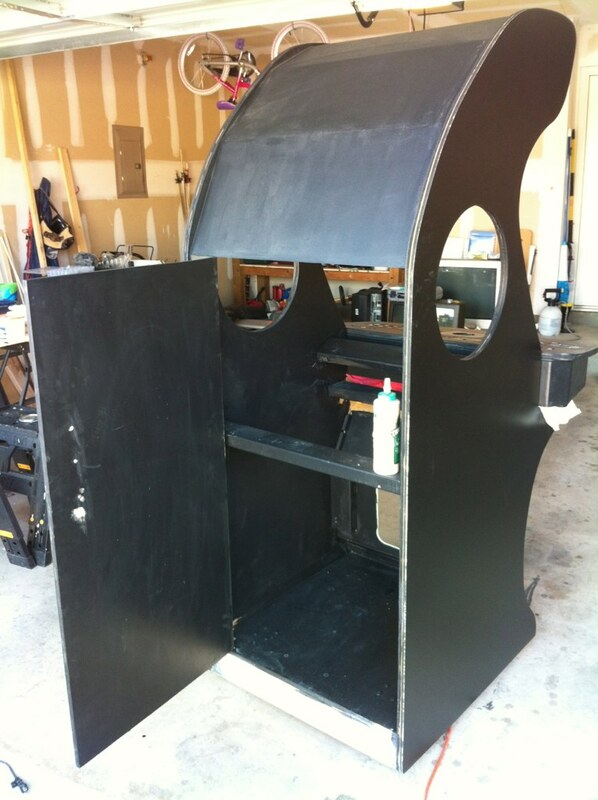 I plan on mounting the monitor, getting the marquee in place, and mounting the speakers. If im lucky, maybe even a little wiring. They are never really finished though. There will always be some new emulator or accessory to add. The colors in the artwork came out a nice match. 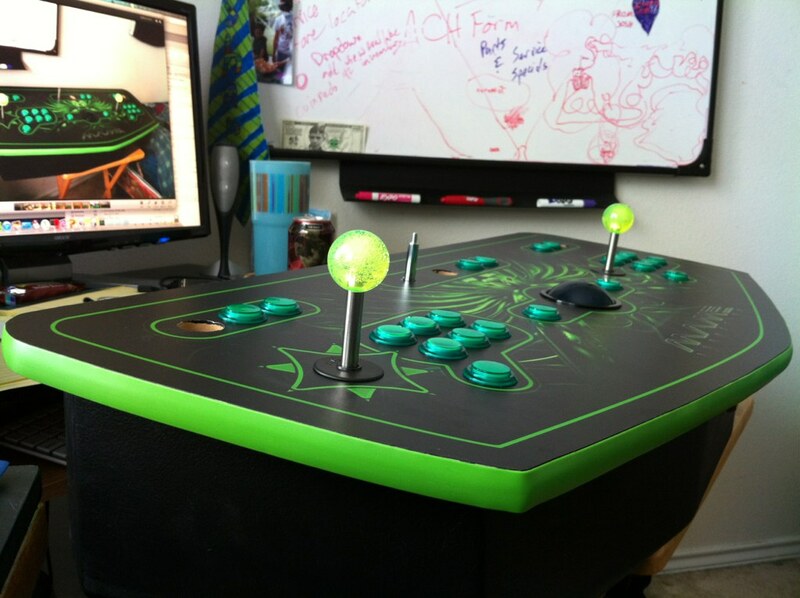 I am still unsure about those joystick ball tops. They really look yellow. I guess I will wait till I light it up to make the verdict. Looking great, just take your time as you are near the home stretch. Can't wait to see some more of this! Looks great, I love the cabinet shape, the theme, the black and green etc etc. that is looking sooooooo good! it just screams 'PLAY ME'! I bet you can't wait to peel that plastic off the monitor. Thanks dandare! I'm amazed that it is coming out as good as it is, I don't know what the hell im doing. That should give some confidence to some of the other noobs who don't get started cause they have never cut a piece of wood. Is that Galaxian green T-moulding? Just read this thread from the start - to produce something of this quality when you have never cut a piece of wood is quite an achievement! Amazing. On another note, I am making a major change. Since the beginning I had been making this with the intention of doing neon rings in the sides ala Epyx and Knievel, but that is now out. I have been working through an idea lately and the neon rings will not allow me to do it. The thought is to have every light on this thing pulse in unison. From the glowing under cab lights, to the marquee and buttons, etc. To do this effectively, I will need to use LED's through the whole thing. I ordered a LED marquee thingy from GGG and have some green LED strips coming in for the undercab. I will end up replacing the NEON rings with LED strips as well. I will just need to diffuse the light a little to try and get a good indirect glow out of them. With that said, I now have a secondary power supply just for the lights, and will need to get another pacled on order. 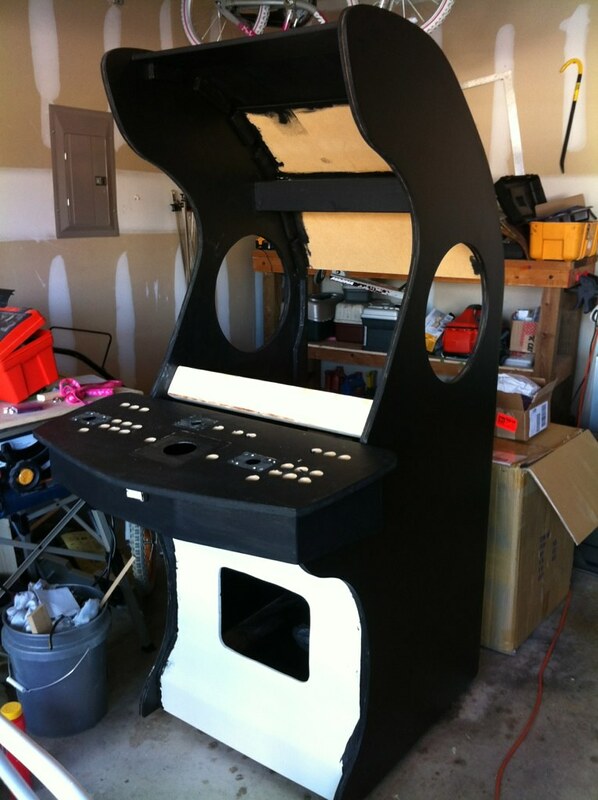 I figure I will be getting to the electronics on this cab within the next week and a half. Fun stuff! Yep, definitely galaxian green tmolding. Also, the matching paint is valspar 6005-10c Greenway. Valspar is lowes I believe. Can you elaborate on this a bit more, you want the entire cab to pulse in unison? Are you gonna use a led-wiz and led-blinky to control the lights? If so the Led-blinky on top of the hyperspin patch(if thats the front end your gonna use) will allow you to do all sorts of cool stuff with your lights. The neon rings should have come with a audio sensor, mainly keyed to bass tones. So you could get a pulse just from the sound of your arcade. I know you have a vision but to me, a single pulse of all the lights would get boring after awhile, and take away from the attract mode of the machine. Once you get to programming your leds and seeing what you can do, i highly doubt your gonna wanna stick with one single unison pulse. With a little work you can use led-blinky and have all your lights blink to the different frequency's from your speakers and have the neon rings light up on the low notes...Just my opinion. Rablack, I don't intend on having the whole thing pulse in unison the whole time, just one of the tricks during attract mode or startup, I haven't seen that far into the future. On the pacled/ledblinky question, yes and yes. Already have them and will start choreographing soon. The main point behind ditching the neon rings was that I want total control over the lighting. Page created in 0.282 seconds with 60 queries.